An online real estate school offers web-based classes to help realtors and brokers pass their real estate licensing exam and gain continuing education credits. We reviewed 10 online real estate schools and landed on the best six—including best overall—based on price, availability, coursework, study aids, and success rates. Real Estate Express (Best Overall) Students seeking affordable exam prep and post-license career guidance. Kaplan Future agents needing instructor-led online real estate courses. 360training Experienced real estate professionals seeking subject-specific refresher courses. Center for Realtor Development Realtors wanting NAR certifications in niche areas like green home sales. OnCourse Learning Brokers seeking group pre-licensure prep for realty exams. The CE Shop Realtors wanting continued education credits for niche specializations like veteran services. Click here to learn more about how we evaluated the best online real estate schools. Real Estate Express is an online real estate school that is not only affordable but stands out for its comprehensive approach to real estate licensure. They provide students with career path information before the real estate exam, prepare them for the exam with effective online courses, and offer guidance on how to make the most of a real estate career post-exam. This is the best option for people seeking an affordable school with excellent career guidance. The pricing for Real Estate Express is dependent on your state and ranges from a low of $389 in California to a high of $649 in Texas. This includes pre-licensure training with exam prep and a money-back guarantee. Compared to other schools on this list, Real Estate Express’ cost is affordable, as they offer a 35% off promo code. Real Estate Express is the only online real estate school on our list that offers prospective students the tools to explore real estate as a career before they register for the exam. Once a student decides to move ahead with the exam, Real Estate Express moves them through effective exam prep, and after the exam, post-licensure continuing education. Real Estate Express offers comprehensive pre-licensure exam prep covering topics like the laws of real estate, finance, and real estate contracts. Agents can also register for post-licensure continuing education (CE) credits. Because all of the courses at Real Estate Express are high quality, the school boasts high pass rates and satisfaction guarantees. 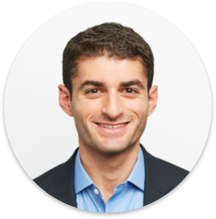 Kaplan offers the same real estate courses for new agents with a less user-friendly platform, making Real Estate Express the better option. However, 360training, which offers coursework for many other industries, might be better for experienced real estate professionals because they offer customizable exam prep that focuses on specialized skills or subject areas. Real Estate Express offers a membership program—as well as per-course pricing—for its continuing education classes, similar to Center for Realtor Development. Covering topics like real estate law and millennial buying behaviors in real estate, their continuing education courses allow realtors to take one class for about $20 or gain access to all classes for $57 per month (before the promo discount is applied). This is a unique continuing education pricing structure for an online real estate school. 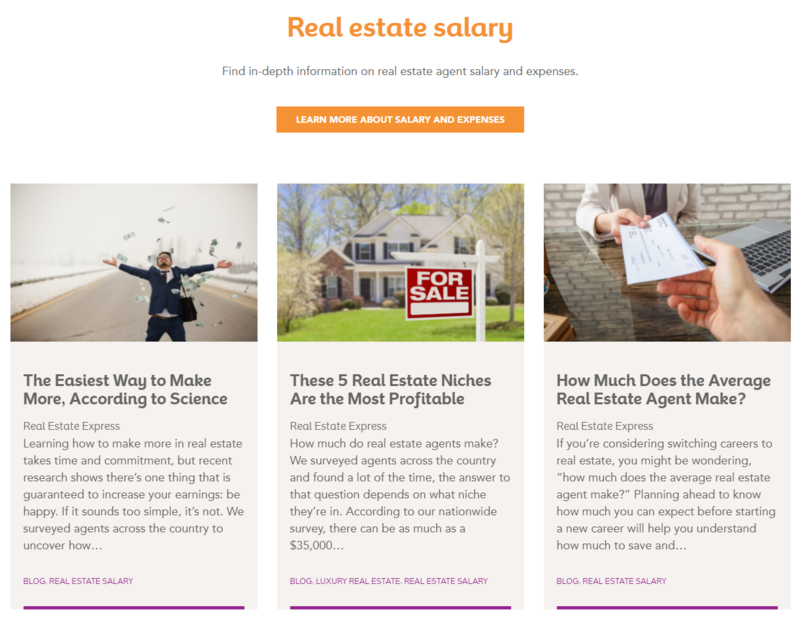 The Career Hub at Real Estate Express gives future agents the ability to find out more about salary expectations, common real estate myths, and setting up a real estate marketing plan. This Hub helps potential agents hit the ground running with information about creating a thriving real estate career. Kaplan has a similar resource center with advice videos and informative webinars. Offering more limited options, The CE Shop distributes a bi-weekly podcast with topics on agent safety and ethics. OnCourse Learning, meanwhile, offers webinars, white papers, and blogs. Perhaps the biggest Real Estate Express competitor in the career resource space, Center for Realtor Development offers networking, events, and information on practically every topic at the highest level through their connection to the National Association of Realtors. Real Estate Express is a real estate school online that is ARELLO (Association of Real Estate License Law Officials) and IDECC (International Distance Education Certification Center) certified. These accreditations ensure that Real Estate Express is adhering to the legal and educational guidelines for a pre-exam real estate course. They also ensure that Real Estate Express’ continuing education courses meet a certain level of quality. ARELLO and IDECC accreditation are both recognized and endorsed by the National Association of Realtors (NAR). Real Estate Express is a good choice if accreditations and third-party verifications are important to you. Unfortunately, Real Estate Express users often don’t have enough time to complete classes before they expire. Access expires in six months due to changes in materials and updates to real estate information. Users rave about the comprehensive, easy-to-understand online format of Real Estate Express. Most reviewers noted that they enjoyed their coursework and that the repetitive nature of the work was reinforcing without being monotonous. Learn more about the real estate school online offerings of Real Estate Express, their money-back guarantee for those who do not pass their exam, and promos available for 35% off via their website below. Kaplan is a real estate school that offers instructor-led online real estate courses to help potential agents study for their realtor exam or real estate broker license. These instructor-led videos—coupled with onsite classes—make it perfect for aspiring real estate agents and brokers who need a more traditional educational model for exam preparation. Kaplan pricing is competitive and dependent on the state. For example, the cost for coursework in California is $399 for online videos and $549 for live, instructor-led review of materials. Texas is also affordable at $429 for video-only real estate classes. Exam prep for some states, like Florida, is not offered by Kaplan. Kaplan is a highly trusted, online real estate school with web-based, live classes. The biggest benefit is the ability to learn from a real agent with actual sales experience instead of a book. If you prefer self-paced study with repetitive quizzes and text-based questions, then Real Estate Express or 360training are better choices. Kaplan real estate school offers a variety of online and in-room, instructor-led courses to help potential agents pass their pre-licensure exam and active agents develop new marketable skills. Kaplan has classes such as Real Estate Law, Property Management, and Sales/Marketing 101; these are available both online and in limited classroom locations, depending on your state. Like OnCourse Learning, Kaplan provides specialty real estate courses, such as home inspection and house appraisal training. 360training also offers a home appraisal course through a third-party partner. While Real Estate Express and The CE Shop both offer extensive post-licensure programs for continuing education, The Real Estate Accelerator from Kaplan combines the best features of both into one online real estate course to prevent realtor drop-off after the exam. This makes Kaplan the better option for continuing education. With the Kaplan Career Toolbox, agents can get career advice and tips from active realtors and brokers about their career path. RealXperts webinars and Toby Talks video series are aimed at taking real estate education to the next level with real-world mentorship about how to launch and grow a real estate career. Similar to the career resources available through Real Estate Express and OnCourse Learning, Kaplan builds its online real estate school around each stage of becoming and remaining a realtor. Center for Realtor Development leverages the power of the NAR to create the same type of experience, while The CE Shop and 360training lag behind both. Kaplan offers a unique type of real estate web course that is a hybrid between continuing education and career development. The professional development classes include the Real Estate Accelerator two-day boot camp for new realtors to help them get through their first year of licensure. With commercial real estate and brokerage business training, these real estate courses add real-world experience to the learning environment. Kaplan has been dinged for having technical issues, such as locking students out of their accounts and failing to load test materials. If you are not technically savvy or low on time, then Real Estate Express might be a better choice. Most users reported that Kaplan provided a strong body of knowledge for real estate agents seeking a crash course for licensure through instructor-led online classes. They also appreciate the career advancement tools and support. For learners who want instructor-led classes as part of their online real estate school, Kaplan is a good choice. Learn more about Kaplan’s online classes below. 360training is an online training platform with courses geared toward real estate professionals, like office managers or broker assistants, who want to brush up on specific real estate concepts before taking their state licensing exam. Single-topic classes are $79 per course. Given this focus, 360training is best for potential agents with industry experience who need help with only a few specific subjects or concepts before taking their exam. 360training pricing is affordable at $79 if you only need a single, subject-specific prep course. If you need a full pre-licensure class, the cost is dependent on your state and costs $110 in Florida, $175 in California, and $495 in Texas. Full pre-licensure classes do not include topic-specific pre-exam prep. 360training offers hundreds of courses online that cover topics from human resources to finance. Because of the course specificity, 360training can be used for exam prep or continuing education, but they have no designated continuing education classes. If you are seeking comprehensive exam prep or career-building guidance, Kaplan, The CE Shop, and Real Estate Express are better choices because their curriculums are targeted toward new real estate agents without industry experience. Like Center for Realtor Development, Real Estate Express, and The CE Shop, courses are listed by state and cover subjects like taxes, fair housing, and brokerage administration. Like OnCourse Learning and Kaplan, 360training provides a real estate course for home appraisals and house inspections. The benefit is that you can take just one subject-specific course to help you brush up on a key topic. 360training focuses on subject-specific courses. For this reason, it is the least able of all of the schools on this list to offer support to students after they become realtors. For potential realtors who want to segue into after-exam networking and career support, Center for Realtor Development is the best option because its connection to the NAR means newly licensed agents can easily contact members all over the country. If you are only seeking career support through online materials, then OnCourse Learning, Real Estate Express, and Kaplan are the best choices. 360training is the only online real estate school that separates exam prep from pre-licensing classes. By offering single, subject-specific courses for $79, real estate professionals can brush up on the subjects they don’t know well without having to spend hundreds of dollars on a full exam prep program. 360training.com is missing a user-friendly online experience. Users who reported issues with the online platform consistently noted that it was burdensome to move between modules and slightly clunky for an online real estate school. Most users reported a great overall learning experience with the 360training real estate course online material. A few users noted that there were some glitches in the interface that need to be addressed, as they make the online learning experience less effective. Visit 360training to learn more about discounts and the specialty real estate course offerings that can help you prep for your realtor exam. Click below to learn more. Center for Realtor Development (CRD) is an online real estate school focused on providing post-license coursework for niche market certifications and designations. These courses are endorsed by the NAR and include things like green real estate. Given its unique focus, CRD is ideal for realtors who want to target new markets with certifications ranging from green real estate to military relocation. Courses at CRD range from about $100 to $700, depending on your state. However, membership in the National Association of Realtors is also required. The dues for the National Association of Realtors (NAR) are $150 per year. Only open to realtors who are NAR members, CRD focuses entirely on continuing education coursework and certifications for realtors who want to work with niche audiences like veterans or unique properties such as green homes. The CE Shop is also a good choice if you’re looking for a wide variety of continuing education classes, but CRD online courses are approved by the NAR. CRD offers certificates and designations in areas like diversity, negotiation, military relocation, and green housing—similar to 360training or The CE Shop. However, CRD’s certificates and designations are approved by governing boards within the realty industry, making it the best option for these types of certifications. CRD is focused on expanding realtors’ skill sets to increase their income, so new classes are always launching that reflect trends in the real estate industry. The subject matter for these classes is decided by CRD in conjunction with the NAR, both of which regularly monitor the industry to see how shifts in buying and selling behaviors might require additional training or information. CRD gains credibility as an online real estate school from their close ties to the NAR. To help share the most up-to-date information with realtors, the CRD covers timely topics in podcasts, such as how to plan a social media strategy, how to work with lenders, and how to explore the elderly care market. CRD can be hard to beat because the local NAR chapters provide valuable realtor advice and networking opportunities, but their online career resources are limited for a real estate school. If you want to increase your online career resources, then Real Estate Express, OnCourse Learning, and Kaplan are much better choices. The topics for continuing education at CRD are more timely than those offered by other schools. Listed by state availability, these topics include solar housing real estate, senior real estate specialty, generation buys, and second vacation home sales, among many others. CRD is missing pre-license prep for the realtor exam. By design, CRD only offers continuing education, designations, and certifications for NAR members who already have a real estate license. If you are searching for pre-license and exam prep classes, then Real Estate Express, Kaplan, and 360training are better choices. According to Facebook reviews, realtors love the diversity and career advancement choices offered by CRD online real estate school. The selection of classes and presentation of materials are a hit with agents and brokers. CRD is presented by the NAR for realtors to expand their services and real estate knowledge. Find out more about the certifications and designations they offer with a 20% discount on their website. Click below to get started. OnCourse Learning is an online school that focuses on group-based pre-licensure real estate courses for agencies and brokerages. OnCourse Learning is unique because they offer brokers a turnkey solution that includes marketing materials and reporting for groups of potential agents. OnCourse Learning is right for brokers and realty firms seeking to provide pre-exam prep for several agents at once. OnCourse Learning pricing is considered moderate and varies by state, starting at $157 for Florida pre-licensure exams, and increasing to $359 in California and $566 in Texas. There is even a broker post-license training package that starts at $299 for five classes. To offset the cost, OnCourse Learning offers a 25% discount promo code on their website. Brokerages can sign up for group training with OnCourse Learning, then have individual agents log on using a brokerage account for study and exam prep. Like 360training, OnCourse Learning focuses on providing large group experiences instead of individual support and networking. Topic-specific training is not part of the OnCourse Learning experience. For brokers who need to provide basic training for a group of potential agents or create educational opportunities for future brokers in a franchise, OnCourse Learning is the right choice to meet your needs. However, if you are seeking individual attention and education in a real estate school, Real Estate Express, Kaplan, or The CE Shop is a better fit. OnCourse Learning also provides continuing education classes as a part of their regular offering, but the subject matter is limited to broker-specific material or high-level business topics like management. For a broader selection of continuing education classes, Real Estate Express and The CE Shop are better options. Recently, OnCourse Learning merged with Career WebSchool, providing students with a wealth of career resources. With webinars, videos, blogs, white papers, and NAR networking events, OnCourse Learning covers topics like how to start your career as a new agent and how to find investment properties in a neighborhood. OnCourse Learning helps real estate organizations address their needs for large-group training and professional development. With less focus on meeting the needs of individual agents, OnCourse Learning instead targets brokers, associations, and private institutions as the right audience for their online real estate school. Following the merger mentioned above, OnCourse Learning has focused on group training and therefore fails to address the needs of individual realtors. There is very little support for students who need personalized study options. The one review in G2Crowd expressed happiness with the courses and the information provided through the newsletter. The reviewer felt that the annual plan was a better deal than the monthly plan. Find out more about OnCourse Learning for brokers and larger teams on their website. Visit their social media to get promo codes for up to 30% off registration, then click below to get started. The CE Shop is an online real estate school specializing in continuing education for niche markets; topic areas include marketing to gain leads, home buying for veterans, and marijuana in real estate. The CE Shop is unique because the breadth of their continuing education (CE) courses allows realtors to target niche markets while building their knowledge base, so it’s best for agents who are looking for continuing education credits in niche markets. The CE Shop pricing varies widely by state. Coursework in Florida starts at $239 and California is a reasonable $279, though Texas enters at the high end at $959 for pre-licensure classes. There is a monthly payment plan available, plus a free trial and money-back guarantee. There is also a 20%-off promo available for new members. The CE Shop is entirely focused on helping realtors satisfy their continuing education requirements; as such, it does not offer real estate exam prep. 360training is probably the most comparable in non-real estate exam prep courses with about 650 classes, but The CE Shop courses tend to cover more niche topics. The CE Shop offers a wide array of continuing education credits for realtors seeking more targeted courses in niche markets. Subjects include real estate law, short sales, marketing, personal safety, and social media (just to name a few). They boast an extensive catalog of courses for continuing education, and each is available to purchase individually. The CE Shop has a podcast called “The Shop Talk” that posts new episodes every other Wednesday. “The Shop Talk” podcast educates agents on how to grow their realty sales and create a business in the real estate industry. Experts give tips and advice on topics such as transitioning from another career to real estate, and how to manage ethics in real estate. There are less than 10 “Shop Talk” podcast episodes as of this publication date, so there is not a lot of material or support. Kaplan, OnCourse Learning, and Real Estate Express are better choices for scope and amount of material. Also, Center for Realtor Development has a collection of networking events with an extensive collection of online career resources for realtors, so consider them for more robust career support. While all of our inclusions on this list save users time and money, The CE Shop takes the extra step of letting the prospective agents experience the learning platform with a five-day free trial. The five-day free trial is unmatched in the online real estate school industry. If you are seeking several continuing education classes from an online real estate school, it might be worth looking at Real Estate Express. Their monthly subscription plan will save you money with access to all classes in their catalog for one monthly fee. The CE Shop needs to improve its technical stability. The negative reviews tended to focus on replacing the glitchy online exam proctor—a hindrance to effective learning for many students. Users were satisfied with the contents of the real estate courses and found the information helpful. There were many complaints about The CE Shop’s proctor for exams, however, as mentioned above. Learn more about The CE Shop through their website. You can also find out more about their 35% discount promo for continuing education real estate school online courses and their free trial by clicking below. *Note: Price and Pass Rate are different for each state. For simplicity, we noted a price and pass rate for one state in every major U.S. geographic region as an example. To find out the price and pass rate for your state, please contact the appropriate real estate school. Finding the time and materials needed to prepare for the licensing exam can be difficult, which is why the convenience of an online school is appealing. In order to ensure our rankings offered both convenience and top-quality education, we considered factors like time investment required, networking, support, and post-licensing opportunities as the foundation of achievement and career growth. Price – While the cost of online real estate schools varies greatly from state to state, we included schools in this list that provide great value. This was determined by considering the quality of the coursework, study materials available, and the likelihood of passing the licensing exam and/or advancing an agent’s career. Availability – While a vast number of states do accept real estate school online coursework, there might be state-based restrictions on what online real estate school courses are accepted. We considered these restrictions in our list. Length of Program – Most of the online real estate schools on our list estimate an average time for completion between six to nine months, but the actual finish date is up to the learner. There is usually a six-month beginning-to-end restriction. Study Aids – From offering study manuals to focus groups, an online real estate school has to go the extra mile to help students embrace concepts and prepare for their real estate license exam. Success Rate – If the online real estate has a strong pass rate on the first attempt, then it indicates they successfully prepare students for the exam. Coursework – While costs and credit hour requirements vary greatly state to state, the real estate exam prep course content in each is largely similar. Therefore, we spent more time considering exam pass rates, continuing education course offerings, and career resources. Real Estate Express is the overall best online real estate school due to their affordable tools for helping potential realtors pass the licensing exam and launch their career after the exam is passed. Real Estate Express aids students in determining if real estate is a suitable career path, set expectations of what they will encounter in the licensing process and guides them through licensure. Do I Need a Real Estate License in My State to Be a Realtor? Yes. Most states require a potential realtor to be of a certain age, attend real estate prep classes, and pass a license exam to become an agent. The requirements vary from state to state, so it is important that you check for any additional restrictors or regulations in your state. Is There a Membership Option for an Online Real Estate School? Yes. Real Estate Exam Scholar costs about $29 for a six-month membership. With practice exams, free flashcards, and a guarantee to refund your money if you do not pass the exam, Real Estate Exam Scholar might be a good choice for prospective agents with some real estate experience. Does My State Accept Online Prep Classes? While many states will accept an online real estate course, not all do. When you pick an option from our six best online real estate schools, a quick browse through the menu will tell you what is available in your state and the requirements for enrolling in online real estate schools. An online real estate school allows potential agents to find out more about the realty industry, study for their realtor exam, complete real estate courses for continuing education, and get special designations. From the exam through post-licensure, the best online real estate school can help realtors move forward in every phase of their career. Our pick for best overall real estate school online is Real Estate Express because of their affordable pre-exam real estate courses, as well as their support for career advancement post-licensure. Learn more about Real Estate Express by visiting their website below. Again, another very informative article! Thank you for the information. I had a question regarding the online video presence in the careerwebschool packages. I am confused because your article mentions that they don’t have video instruction and an interactive study group, however when I looked at their packages online, they state that “The Works Deluxe” package includes a National & Virtual Study Program. They are described as live webinars with a virtual classroom setting with an expert instructor. Does this qualify as an online video? I think this is a newer feature they are offering. We only update our articles on a schedule, so will address this when we do an update. Thanks! Yan is correct. Your price for the Kaplan school is only exam prep, not for video courses. It looks like actual training and books start at the $599 package. Very misleading for you to say training courses, but use exam prep prices. Which state are you looking at? Our pricing is a general range for all 50 states. How does this pricing compare to other options? Great article. I am considering entering the real estate business, but more importantly, am looking to buy & am wanting to get considerably more informed. Would you still recommend these schools? Taking a real estate class will definitely give you plenty of useful information for buying a home in your state. That said, in most cases, working with a buyer’s agent will be far more useful. Hi, the payment plan information is not true of Real Estate Express. I just called them based on your information and requested a payment plan. The representative stated ‘We don’t have a payment plan yet but I can give you a great discount for the holiday.” So, if someone from this company informed you that they have a payment plan they are lying. Thanks for reaching out and your tip. Will reach out to Real Estate Express today to confirm and update the article accordingly. Hi Emile — appreciate the detail of this article. I am currently on the fence between doing Home Study vs. On Demand w/ Kaplan for the state of CA. I’d like to save the $300 if possible Do you know if there are still practice exams in the text books or available online with Home Study? I feel I have the mental capacity to complete via Home Study, but the practice exams are extremely important to me. I am fairly certain there are practice exams included in the home study package. In order to be 100% certain, reach out to Kaplan and ask about the package available in your state.